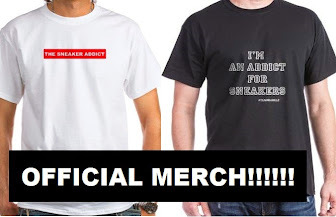 THE SNEAKER ADDICT: With Or Without The Ring? With Or Without The Ring? With Or Without The Ring? A question a lot of sneaker addicts ask, whats your opinion on wearing these Champ pack kicks with that Ring on it? Peep a video after the jump from Dj Delz to help you out! THIS IS A TOUGH ONE!! I am really torn, wear the ring with the shoe or not. HMMMMMMMM! I gotta say, the RING is really the whole point ,of the shoe, at least to me. Seems to me, just the gold by itself is a little 'flashy'. ALL IN ALL, they're AWESOME looking!! Larry,Naples,FL.